Oakley has developed a pair of goggles that can be worn over the top of glasses. 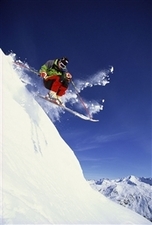 People need their eyes to be protected while skiing and contact lenses are not always suitable as they can dry up in exceptionally cold conditions. So Oakley has developed some goggles which can cover almost any glasses, allowing skiers increased comfort and safety. The sport accessories giant has specially designed the goggles with a foam configuration creating a seal, a unique fit, anti-fog treatment and a dual lens for even more venting. International skier Manuel Osborne-Paradis recently revealed that this season he will try wearing new hard contact lenses, legal in international skiing, suggesting that one day they may become a common piece of skiers" equipment. Bausch & Lomb recently unveiled its new FogShield Sport pre-moistened towelettes which prevent fog from forming on goggles for eight hours as well as helping keep them clean.